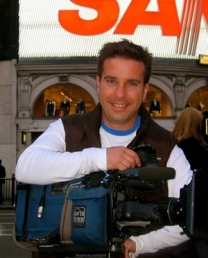 Joe Ferma is an ACS award winning Lighting Cameraman with more than 25 years experience behind the camera. His technical skill and creative eye, combined with his amiable nature, make him a popular choice with clients across an array of industries. Rising through the ranks in the Nine Network’s News and Current Affairs division, he knows what it means to meet and beat a deadline. His experience on location, across Australia and the World, has forged his skills leading him to take out a Gold and Silver Award at the Australian Cinematographers’ Society Victorian and Tasmanian Awards. Joe has worked worldwide on Travel stories, Current Affairs & Documentaries. His journeys have taken him to UK, USA, Canada, Japan, China, Egypt, New Zealand, Fiji, Vanuatu, New Caledonia, Hong Kong, & Singapore.